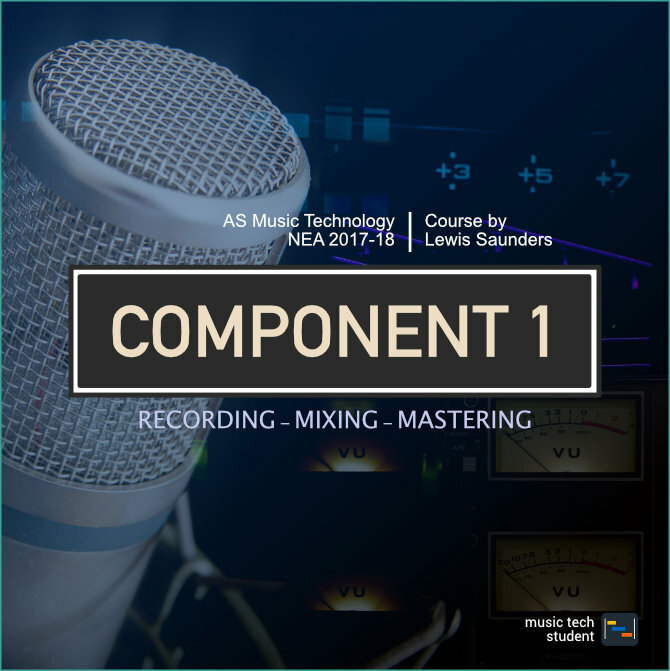 In this lesson, we will learn how to prepare our Logic Pro X session for recording, as well as how our signal gets from our microphone or instrument into our session. When it comes to pro audio cables, there are two main types of plugs: 1/4” jacks and XLRs. 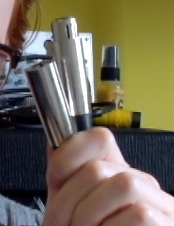 The male XLR plug has a barrel with three pins, which correspond to three holes on the female plug. 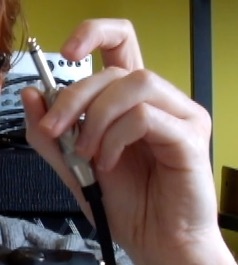 Normally, an XLR cable will have a male plug on one end, and a female plug on the other. XLR cables are balanced, which means that the signal is less susceptible to noise and interference, and the cable can be longer without signal degradation. Because they are balanced, and can carry phantom power, XLR cables are used to connect microphones. 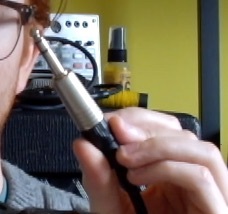 A 1/4” jack plug looks a larger version of the one you will find on a set headphones. Jack cables can be either balanced or unbalanced. TS (tip-sleeve) jacks are unbalanced, and are usually used for instruments like guitars and keyboards. TRS (tip-ring-sleeve) jacks are used either to carry a balanced mono or an unbalanced stereo signal. Let’s examine the signal path from your microphone to Logic. The microphone converts sound into an analogue signal, which is then amplified by a preamp (we may also describe this process as adding gain). This strong signal is then converted to a digital signal by an A/D converter. This digital signal can be captured by Logic. When the signal leaves the computer, it has to be reconverted back into analogue with a D/A converter. 1. In the top bar, select “Logic Pro X”. 2. From the drop down menu select “Preferences” > “Audio…”. 3. Under the “Devices” tab, ensure that “Core Audio” is ticked. 4. Set “Input Device” to match your audio interface, for example “Focusrite Scarlett 2i2”. You should also set the “Output Device” to match your interface. 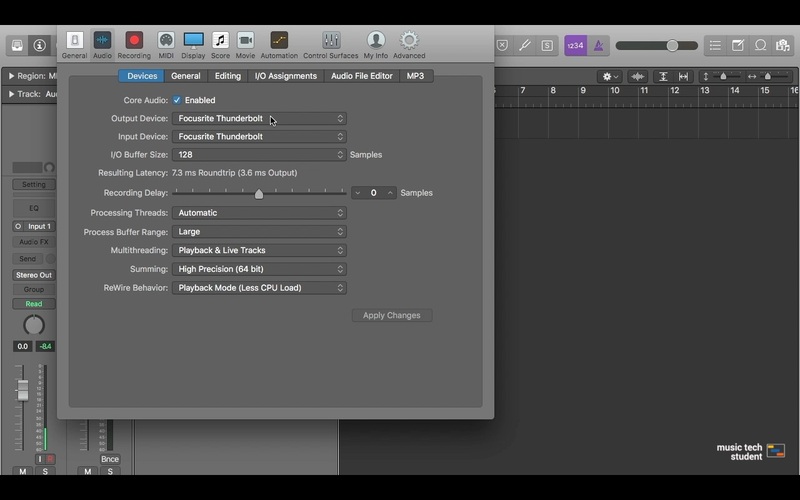 Now that Logic knows which audio device to use, create a new audio track (Option + Command + A). We are going to tell this track to record from input 1 of our audio interface by opening the inspector panel (I) and selecting “input 1” from the input selector. Now Logic can “hear” our input, but if we were to hit record, only the selected track would record audio. We can manually tell Logic which tracks to record audio to by toggling the “R” Record Enable buttons on each track. 1. Create two audio tracks in Logic. 2. Set the input for the vocal track to input 1, and set the input for the guitar to input 2. 3. Record Enable both tracks by clicking on the “R” toggle in each track. Question 1: A microphone will convert sound into a ...? Question 2: Are 1/4” jack connections balanced or unbalanced? Question 3: When the signal path is travelling from the sound source to be recorded in Logic, what conversion will occur? Question 4: Where would you change the audio device that Logic uses? Question 5: What is the record enable button for?